Realme Starry Tour – Hi Guys , Hope You are Enjoying our website. 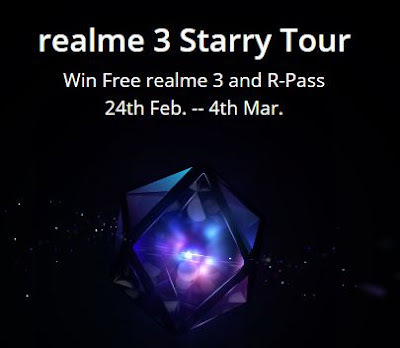 Here Comes Another Contest From Realme & That is Realme Starry Tour Contest. This Contest Is Same Like Last Realme Yo Days Contests, Which We Have Posted Here. User Have to Send The Power To Get The Rank Up. Lucky Rank Award (100)- 100 realme buds Participants whose rank ends with 333 from No.1333 to No.95333 are eligible to win realme buds. And last 5 rank holders are also eligible to win realme buds. 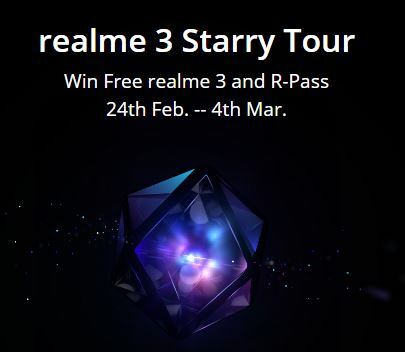 You will get 3 Starry Particles at the beginning of the contest, and 3 additional Starry Particles will send to those who have participated in realme Yo!Days, Realpublic Sale and Community Posts (commented or posted in the community before February 20), this can be superimposed up to 9 bonus particles. 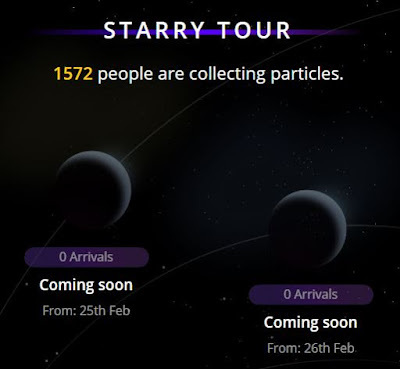 Bonus particles will appear on realme India Official Website. Those who are lucky to find the bonus can get additional particles from 24th Feb to 4th March, except 26th Feb and 28th Feb.
24th Feb to 4th Mar, 2019.